The Blue Ridge Chamber Orchestra is a classical string ensemble of roughly two dozen musicians who love playing and performing, and who seek the camaraderie of others who share this vocation. For three decades, the BRCO has provided this opportunity. Orchestra members include adult musicians of all ages from Charlottesville and surrounding central Virginia. Our membership includes local music teachers and semiprofessional performers, veterans of high school and college orchestras, and advanced/intermediate adult learners. We try to increase local interest in chamber and orchestral music through our concerts. Our two or three programs each year have featured local musicians as soloists, and music by local composers. As a dynamic community organization, we are always open to adding new members, subject to balance in the sections. Please contact us if you are interested in joining. We rehearse on most Monday evenings during the academic year at Charlottesville Friends Meeting, 1104 Forest Street, in central Charlottesville. Spring Concert: 3pm, Saturday, May 4. Meade Hall, Christ Epicopal Church, 2nd St NW and High St, Charlottesville. (Enter from 2nd St.) Admission $5. Contact us: Email: BRCO. Phone: (434)-295-1617. Join us: We welcome new musicians! Fall 2019 rehearsals will be starting in late August. If you are an intermediate or advanced musician, and think you might enjoy playing with the BRCO, please use the above contact info. Rehearsals are normally Monday evenings from 7:30-9:30, at Charlottesville Friends Meeting, 1104 Forest Street, Charlottesville. (This is next to Murray High School.) We currently have particular need of violinists. Vivaldi - Concerto for strings in G minor, first movement (Allegro molto). Recorded at the BRCO concert of October 8, 2000. Ross - Sinfonietta Concertante, third movement. Recorded at the BRCO concert of December 8, 2007. Gluck - Orpheus and Eurydice, Overture. Recorded at the BRCO concert of December 8, 2012. Rutter, Suite for Strings. Recorded at the Spring 2010 concert. Bach, Concerto for two violins (soloists Elizabeth Wagner and Hank Schutz), and Ross, Fantastic Dances. Recorded December, 2012. Respighi, Ancient Dances and Airs, Suite no. 1, and Myslivecek, String Quintet no. 3. Recorded December, 2013. Bach, Violin concerto in E major (soloist Hank Schutz), and pieces by Sibelius, Dvorak, and Janecek. Recorded May, 2016. Telemann, Concerto for Three Violins in F major (soloists Joanna Freeman, Elizabeth Wagner, Hank Schutz). Recorded December, 2016. During a professional orchestral career of more than two decades, Richard has worked with some of the world's leading conductors, including Eugene Ormandy, Bernard Haitink, Edo de Waart, and David Zinman. In the Netherlands, he was the violist with the Rotterdam String Quartet, and made numerous recording with Dutch National Radio. After receiving a masters degree in performance and pedagogy from Northern Illinois University, he taught at Salisbury State University, where he cofounded the Salisbury Youth Orchestra, and directed the orchestra of the Maryland Gifted and Talented program at Goucher College. For eleven years, he served on the music faculty at the University of Virginia, where he was principal violist of the Charlottesville and University Symphony Orchestra, and member of the Rivanna String Quartet. Currently, he is director of string education at Henley Middle School, and maintains a private studio in Charlottesville. The BRCO was founded in 1988 by local violinist and teacher Alexandra McCracken, with the purpose of providing a setting in which adult musicians of varying musical backgrounds might experience the joy of making music in a collegial, non-competitive setting. When Ms. McCracken left the area in the early 1990's, the conductor's baton was passed to Richard Baritaud. In this period, the orchestra regularly played concerts at the new Senior Center. We still maintain a variant of this tradition by playing "dress rehearsal" concerts at various of the local area retirement communities. Philip Clark conducted the orchestra in the late 1990's. A musical highlight was playing Concerto for Bassoon and Strings by Walter Ross, emeritus professor of music at U VA and bass player in the orchestra for many years. Paul Kim, a graduate student of conducting at U VA, directed the orchestra in 2002. When he was called up for army reserve duties the next year, local musician and conductor Eric Stassen ably guided us through our next concert. Since fall of 2003, the BRCO has been reunited with Richard Baritaud. Our spring 2004 concert included the premiere of Paul Kim's Dave Matthews Band Concerto, guest conducted by the composer. We have played as part of both the Jefferson Thanksgiving Festival and the Bach's Lunch concert series. Various of our concerts have continued to feature music by Walter Ross; in particular, three Ross works were played at the December 2012 concert. Hank Schutz served as concertmaster for most of the group's 30 year existence. Beginning in fall 2018, Rahima Elizabeth Wagner is the orchestra's concertmaster, after ably sharing concertmaster duties with Hank in recent years. Our 2018 fall concert was held on Saturday, December 15 at Meade Hall, Christ Episcopal Church, in downtown Charlottesville. The program featured Viola concerto in G major by Georg Telemann with our principal violist Ray Varona as our soloist. The concert opened with Corelli's Concerto grosso in G minor Op. 6, no. 8, also known as the Christmas Concerto. Also on the program were the Adagio et grave and Allegro movements from Mendelssohn's Sinfonia no. 8 in D major and the Allegro movement of Dvorak's String Quartet in F Major Op. 96. The program was also played the Monday before, at the Our Lady of Peace retirement community. Our 2018 spring concert was held on Saturday, May 12 at Meade Hall. The program featured Violin concerto in D minor by Antonio Vivaldi with our retiring concertmaster Hank Schutz as our soloist. The concert opened with Mozart's Divertimento no. 1 in D major, and also included the Allegro moderato and Nocturne movements from Quartet no. 2 by Alexander Borodin, St. Pauls Suite by Gustav Holst, and the Pizzicato Polka by Johann and Josef Strauss as an encore. The concert served as a celebration of Hank Schutz's 30 years of musical leadership with the BRCO. The program was also played the Monday before, at the OLOP. Our 2017 fall concert was held on Saturday, December 9 at Meade Hall. The concert opened with Alexander Glazunov's Theme and Variations, followed by Violin concerto in A minor by Antonio Vivaldi, with Rahima Elizabeth Wagner as our soloist. The concert continued with Adagio for strings by Samuel Barber and A Moorside Suite by Gustav Holst. The program was also played the Monday before, at OLOP. Our 2017 spring concert was held on Saturday, May 6 at Meade Hall. The program featured Violin concerto in A minor by J.S.Bach with Joanna Freeman as our soloist. The concert opened with Edward Grieg's Holberg Suite, and also included Sinfonia Concertante by UVA professor emeritus Walter Ross, Serenade op.10 by Ernst von Dohnanyi, and 12th of December by Tracy Silverman. The program was also played the Monday before, at OLOP. Our 2016 fall concert was held on Saturday, December 3 at Meade Hall. The program featured Concerto for three violins in F major by G.P.Telemann. Our soloists were Joanna Freeman, Elizabeth Wagner, and Hank Schutz. The concert opened with Andante Festivo by Jean Sibelius and Paul Hindemith's Eight pieces for string orchestra. The second half of the concert included Brandenburg Concerto no. 3 by J.S.Bach, John Rutter's Suite for strings, and Shenandoah Rhapsody by Walter Ross. The program was also played the Monday before, at the Westminster-Canterbury retirement community. Our 2016 spring concert was held on Saturday, May 14 at Meade Hall. The program featured Concerto for violin in E major by J.S.Bach with Hank Schutz as our soloist. The concert opened with Romance in C major by Jean Sibelius, and also included the opening movement of Seranade by Anton Dvorak, movements I,III,V, and VI from Leos Janacek's's Idyll for Strings, and Divertimento no. 3 in F major by W.A.Mozart. The program was also played the Monday before, at WC. Our 2015 fall concert was held on Saturday, December 5, at Meade Hall. The program included Music for String Orchestra by Walter Leigh, Rumanian Folks Dances by Bela Bartok, Flute Concerto in G major by Giovanni Pergolesi, Four short pieces by Cesar August Franck, Blues for Oaktown by Darol Anger, and Benjamin Britten's Simple Symphony. Katie Calaway was our flute soloist. The program was also played the Monday before, at OLOP. Our 2015 spring concert was held on Saturday, May 2 at Meade Hall. The program included Concerto Grosso Op.6, no.3, in E minor by G.F.Handel, Violin Concerto, op. 4, no. 1 by Antonio Vivaldi, Symphony in A major by C.P.E.Bach, and Mendelssohn's Sinfonia no.1 in C major. Elizabeth Wagner was our soloist for the Vivaldi concerto. The program was also played the Monday before, at OLOP. Our 2014 fall concert was held on Saturday, December 13 at Meade Hall. The program included Elegy for string orchestra by Morton Gould, Violin Concerto, op. 8, no. 12 by Antonio Vivaldi, Felix Mendelssohn's Sinfonia no. 3 in E minor, Concerto Grosso, Op. 8, no. 2 by Francesco Geminiani, and Edward Elgar's Serenade for String Orchestra. Hank Schutz was the soloist for the Vivaldi concerto. The program was also played the Monday before, at WC. Our 2014 spring concert was held on Saturday, May 10 at Meade Hall. The program included Two Swedish Melodies op. 27 by Johan Svendsen, Violin Concerto, op. 7, no. 8 by Antonio Vivaldi, String Quintet no. 1 by Josef Myslivecek, Mozart's Eine Kleine Nachtmusik, and Mendelssohn's Sinfonia 2 in D major. Paula Scott was our soloist for the Vivaldi concerto. The program was also played the Monday before, at OLOP. Our 2013 fall concert was held on Saturday, December 14 at Trinity Episcopal Church, in Charlottesville. The program included Two Icelandic Melodies by Johan Svendsen, String Quintet no. 3 by Josef Myslivecek, Ancient Airs and Dances, Suite 1 by Ottorino Respighi, Concerto Polonois by Telemann, and the first movement of Mendelssohn's Sinfonia 8 in D major. The program was also played the Monday before, at WC. Our 2013 spring concert was held on Saturday, May 11 at Meade Hall. The program included the Concerto no. 1, op. 10 by Albinoni, Ancient Dances and Airs, suite 3 by Respighi, Andante Festivo by Sibelius, Mendelssohn's Sinfonia 10 in B minor, and movements I and V of Caminos Argentinos by Jeff Manookian. The program was also played the Monday before, at the OLOP, and selections were played in the Bach's Lunch concert series on May 9. Our 2012 fall concert was held on Saturday, December 8 at Meade Hall. The program included the Overture and Dances of the Blessed Spirits from Orfeo and Euridice by C.W.Gluck, Concerto for two violins by J.S.Bach, and three pieces by University of Virginia professor emeritus of music Walter Ross: Fantastic Dances, Sinfonietta Concertante, and Shenandoah Rhapsody. The flute soloists for Dances of the Blessed Spirits were Kimberly Chafee and Matthew Heinrich and the soloists for the Bach concerto were Elizabeth Wagner and Hank Schutz. The program was also played the Monday before, at WC. Our 2012 spring concert was held on Saturday, May 12 at Meade Hall. On the program was the Abdelazer Suite by Purcell, Adagietto for strings by Robert Kajanus, John Ireland's A Downland Suite, Vivaldi's Concerto in G Major "Alla Rustica", Peter Warlock's Capriol Suite, and Pleasant Memories by Scott Joplin. The program was also played the Monday before, at WC. Our 2011 fall concert was held on Saturday, December 10 at Meade Hall. The program included Concerto Grosso op.6 no.8 by Corelli, Theme and variations for string orchestra in G minor by Glazunov, Villa-Lobos' lovely Aria Cantilena, as well as Fantasia on a theme by Thomas Tallis by Vaughan Williams, Fiddler's Fury by Stafford, and Song to the Moon by Dvorak. The program was also played the Monday before, at the OLOP. Our 2011 spring concert was held on Saturday, May 7 at Meade Hall. On the program was Concerto Grosso op.6 no.7 by Handel, Violin Concerto in B flat major by Vivaldi, Holberg Suite by Edvard Grieg, the waltz movement of Seranade for Strings by Tchaikovsky, and the Pizzicato Polka by Johann Stauss. Annie Kim was the violin concerto soloist. The program was also played the Monday before, at WC. Our 2010 fall concert was held on Saturday, December 11 at Meade Hall. The program included Concerto Grosso op.6 no.10 by Corelli, Bach's Violin Concerto in A minor with concertmaster Hank Schutz as soloist, Mozart's Divertimento no. 3 in F, and A Moorside Suite by Holst. The program was also played the Monday before, at OLOP. Our 2010 spring concert was held on Saturday, May 15 at Meade Hall. The program included St. Paul Suite by Gustav Holst, Concerto in C major for mandolin and string orchestra by Vivaldi, Serenade in C major by Ernst Dohnanyi, Spider Dreams by David Balkrishnan, and Suite for Strings by John Rutter. Charles Winkler was our mandolin soloist. The program was also played the Monday before, at WC. Our 2009 fall concert was held on Saturday, December 12 at Meade Hall, Christ Episcopal Church in downtown Charlottesville. The program included Sonata III A 5, Op. 2 by Albinoni, Idyll for String Orchestra by Janecek, Brandenburg Concerto No. 4 by Bach, and the aptly titled 12th of December by Silverman. Our soloists for the Brandenburg Concerto were our own Elizabeth Wagner on violin, and high school students Chelsea Meynig and Jessica Kaisoum on flutes. The program was also played the Monday before, at OLOP. Our 2009 spring concert was held on Saturday, April 25, at St. Pauls Memorial Church, located across from the Rotunda at U VA. The program included Sinfonie a cinque, Op.2, no.3 by Albinoni, Sonata no. 4 in D major, Op1, no.13 by Handel, music from Bizet's Carmen, the early 20th century work Meditation on Svaty Vaclave by Josef Suk, and Skylife by David Balakrishnan, founder of the Turtle Island Quartet. The program was also played a week later, at WC. Our 2008 fall concert "Britten, Barber, and the Blues" was held on Saturday, November 22 at Meade Hall, Christ Episcopal Church in downtown Charlottesville. The program included Sonata a cinque, Op. 2 No. 1 by Albinoni, Music for String Orchestra by Walter Leigh, Adagio for Strings by Barber, Simple Symphony by Britten, and Blues for Oaktown by Darol Anger. The program was also played the Monday before, at WC. Our 2008 spring concert "Odds and Ends: three hundred years of string music" was held on Sunday, May 4 at St. Paul's Memorial Church. The program included Suite #2 from the Fairy Queen by Purcell, Andante Cantabile by Tchaikovsky, Notturno in B by Dvorak, two piano preludes by Shostakovich arranged for string orchestra, Crisantemi by Puccini, and Sinfonia in F by Wilhelm Friedmann Bach, the eldest of J.S.Bach’s sons. The program was also played the Monday before, at WC. Our 2007 fall concert was held on Saturday, December 8 at St. Paul's Memorial Church. The program included Coronation Music by Handel, Ancient Airs and Dances by Respighi, Serenade for String Orchestra by Elgar, and Sinfonietta Concertante by our own Walter Ross. The program was also played the Monday evening before, at OLOP. 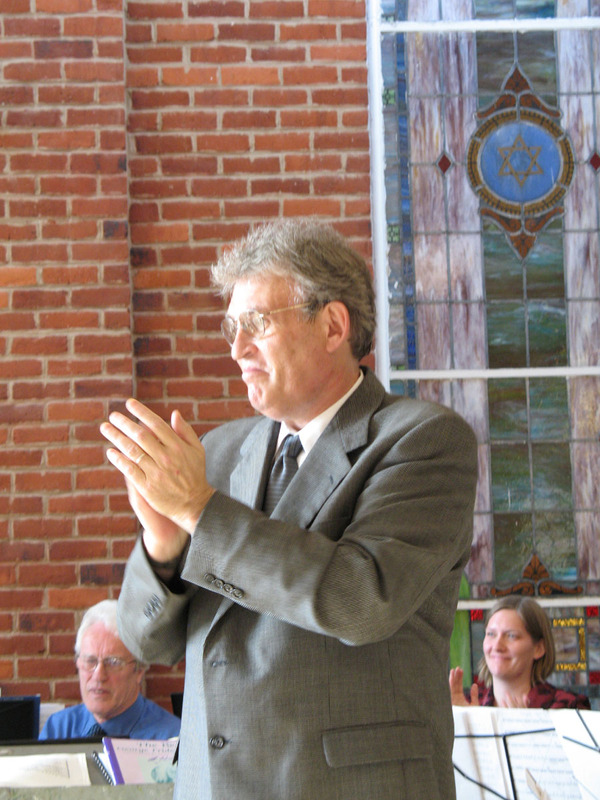 A very successful Mothers Day spring concert was held on May 13, 2007, at Temple Beth Israel in downtown Charlottesville. The program included Albinoni’s Concerto for Strings, Op. 7 No. 4, Arditi’s Il Bacio, Corelli’s Concerto Grosso No. 2, Svendsen’s Zwei Schwedische Volksmelodien, and Vivaldi’s Concerto in G minor, F XI no. 13. The program was also played the Monday evening before, at OLOP.